From time to time the Ancient India & Iran Trust advertises duplicate books and periodicals for sale. Many of these are rare and out of print. We view this as a useful way of helping researchers and also of creating revenue. We have no dedicated income for purchasing current publications so the proceeds from book sales make a direct contribution towards keeping our collections up to date. 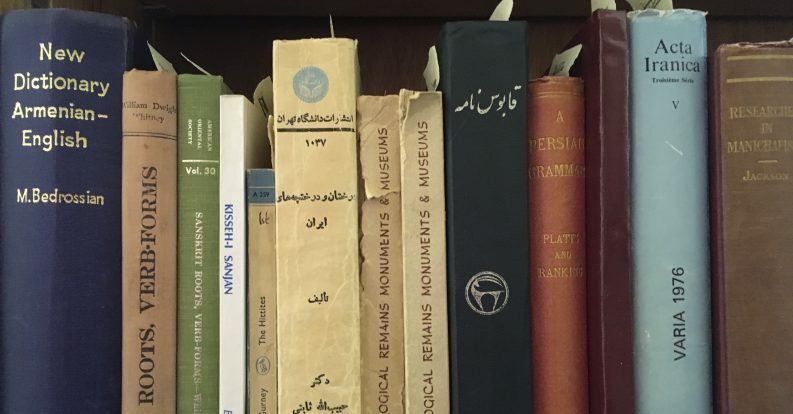 We have just issued a new list of over 800 titles which include many duplicates from the collections of Mary Boyce (1920-2006), Professor of Iranian Studies at the School of Oriental and African Studies, Ralph Pinder-Wilson (1919-2008) and Josef Elfenbein, Professor of Iranian Philology at the University of Mainz. The collection is therefore particularly strong in Iranian and art historical studies. The list also includes over 200 titles on South and South East Asia. The list has been arranged very approximately in broad categories: Central Asia, Tibet, South Asia, Buddhism, South East Asia, Arabic, Armenian, Aramaic, Georgian, Iran/Iranian Studies, Tocharian, Linguistics, Religions, Journals and Miscellaneous. Our lists are as accurate as we have been able to make them in the limited time available, but each item is double checked before a sale is agreed. Publications are not priced but prices usually reflect what is available on the current market. Priority is given to individuals. Please contact us if you are interested in further details, preferably by email at library@indiran.org. Remember to quote the number at the beginning of each item that you’re interested in. We will remove sold titles from the list at regular intervals. Follow the links below to access the list or visit our Duplicates Page to find out more.